Do you dread negotiations for fear of the conflict involved? The fact is that every aspect of our lives involves some form of negotiation—from a salary discussion to a child’s bedtime, a business deal to a high-stakes hostage crisis. In these situations, the only way to get what you think is right is to ask for it. 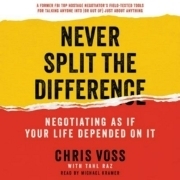 In Never Split the Difference, former expert FBI hostage negotiator Chris Voss details that the best way to do this is to use a set of tools that allows you to better connect with others, influence them, and negotiate for what you want. Never split the difference—it leads to dreadful outcomes. If you want to wear your black shoes, but your spouse wants you to wear the brown ones, splitting the difference means you end up wearing one black shoe and one brown. Compromising is a cop-out, a way to feel safe. Start any negotiation by listening; it’s the only way to create enough trust and safety for a real conversation, to identify what your counterpart actually needs and to get them to feel safe enough to talk about what they really want. Practice good listening—it will help you develop emotional empathy. 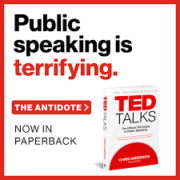 Researchers at Princeton University used an fMRI brain-scan to discover that people who paid the most attention, i.e., really good listeners, could actually anticipate what a speaker was about to say. In her daily TV show, Oprah was a master listener. She was able to get the person she was interviewing to talk about their deepest secrets, using a smile to ease the tension, signaling empathy with subtle verbal and nonverbal signals, and speaking slowly. Use tactical empathy to encourage your counterpart to expand on their situation. You don’t have to agree with them, just acknowledge their situation. Once the other person realizes that you are listening, they are more likely to tell you something that you can use. Mirror what your counterpart says. People are drawn to what is similar and fear what is different. Mirroring encourages the other person to keep talking, and ultimately to reveal their strategy. Label your counterpart’s fears; it disrupts the power of a negative thought or emotion. Labeling essentially short-circuits the amygdala, the part of the brain that reacts to real or imaginary threats. Pushing for “yes” makes people defensive; you have to get past the counterfeit and confirmation yesses in order to get to the real commitment. As Mark Cuban, billionaire owner of the Dallas Mavericks, remarks: “Every ‘No’ gets me closer to a ‘Yes.’” Often, the word “no” just means “wait” or “I’m not comfortable with that.” Once you hear that first “no,” the real negotiation begins. Bend your counterpart’s reality. Psychologists Kahneman and Tversky discovered that people will take more risks to avoid a loss than to realize a gain. Use your counterpart’s loss aversion to persuade them that they will lose something if the deal falls through. Get your counterpart to say, “That’s right!” Once they say this, you’ve reached a breakthrough moment—they are acknowledging that you understand where they are coming from. Columbia Business School psychologists found that job applicants who named a range received significantly higher salaries than those who offered a single number. If your goal is $60,000, give the range of $60,000-$80,000 and they’ll likely come back with $60,000—or higher. Give the number $60,000, however, and they’ll likely offer you less. The person who is really in control in a conversation is the one who is listening—the talker is revealing information while the listener can direct the conversation toward his own goals. The first step to dealing with any counterpart is to identify their negotiating style. Are they an Accommodator, an Assertive, or an Analyst? Psychologist Kevin Dutton coined the phrase “unbelief”—active resistance to what the other side is saying. As a negotiator, your role is to stop the other side from unbelieving; give them the illusion of control through asking for help with calibrated questions. Calibrated questions such as, “How can I do that?” gently push your counterpart to search for other solutions. The negotiation becomes an information-gathering process where your counterpart is vested in creating the outcome that you want. Approaching deadlines—whether real or merely an arbitrary line in the sand—make people do impulsive things. Research by UC Berkeley professor Don A. Moore found that when negotiators tell their counterparts about their deadline, they get better deals. When someone seems irrational, they most likely are not—they’re just being driven by a constraint or hidden desire that you haven’t uncovered yet, or they’re operating on bad information. Any negotiation requires preparation, an outline of your tools. This is the “one sheet” that summarizes your approach. Negotiation is not about creating a win-win situation, finding a compromise, or getting to yes—it’s about connecting with your counterpart so that you can figure out what they really want and using that to get what you want. The key is to practice active listening and tactical empathy: make counterparts feel safe enough to reveal themselves. Frame the negotiation using tools like mirroring (repeating your counterpart’s key words), labeling your counterpart’s fears, and asking calibrated questions that start with “How…?” or “What…?” The first “no” is not the end of the negotiation, but the beginning. Once you get your counterpart to say, “That’s right!” you’ve reached a turning point. Figure out your counterpart’s negotiation style: are they an Analyst, an Accommodator, or an Assertive? Prepare for any negotiation by drawing up a one-sheet list of five key points that summarize your approach.